I know many of you, like me, pretty much celebrate Halloween all year long. But I know that I always look forward to that time in late summer/early fall when the rest of the world catches up and finally gets into the spirit, too. In Southern California, the weather is usually hotter than ever, but I feel an immediate sense of relief when the Halloween decorations make their way into stores. It’s like my body can feel the heat going away and the cooler fall weather coming, even if it hasn’t actually happened yet. For me, that moment came a couple weeks ago when I was out shopping. I headed down to my local 99 Cents Only store for some household supplies. The kitchen supply department in my local store is fantastic so I’m always there perusing for new bargains. It was barely September so honestly I didn’t think the store would have any of its Halloween stuff out yet as they usually keep the school supplies there until mid-September. But as I picked up my cart and began walking into the store, my eyes befell a wonderful sight: Halloween had arrived! There were all kinds of Halloween goodies to choose from and even though my Halloween supplies already take up a good portion of my storage at home, I couldn’t help but to pick up a few more items. Who can pass up a large cauldron for 99 cents? Or baking stencils with cute Halloween pictures on them? My best buy that day were the three light-up paintings I found. hands down. They were obviously tossed out of a larger store, probably at the end of last Halloween season, because the lights don’t work. But that is an easy fix and I now have three canvas paintings with beautiful and spooky Halloween vistas on them. Best deal ever. Now that Halloween 2014 has finally officially begun (for the rest of the world, anyway) what great buys have you found and where? 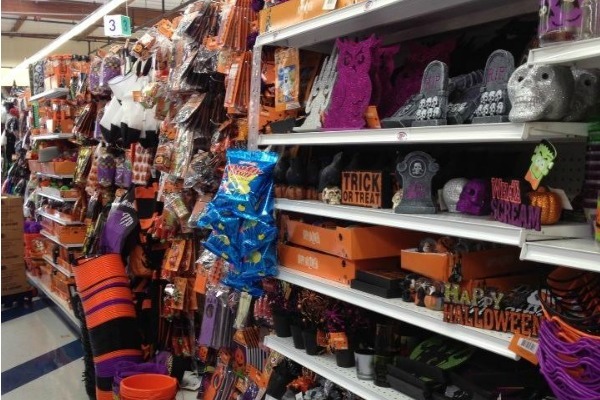 This article was posted in Halloween Shopping and tagged 99 Cents Only Stores, Halloween Decorations. Bookmark the permalink. Follow comments with the RSS feed for this post.Post a Comment or leave a trackback: Trackback URL.